Sometimes people sustain injuries or develop conditions that are so severe that there is little chance of recovery. Long-term disability benefits are offered through the United States Social Security Administration to help support people with serious injuries or ailments. If you apply for long-term disability and your claim is denied or your benefits withheld, it may be in your best interest to consult with a Social Security lawyer to determine your legal options. 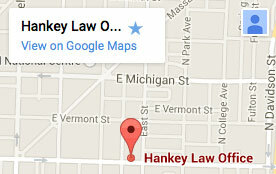 Our Indianapolis long-term disability litigation attorneys at the Hankey Law Office, are committed to helping you to recover the disability payments that you are owed. Contact us at (800) 520-3633. Why Pursue Long-term Disability Litigation? In an ideal world, the Social Security system would be run without a hitch and everyone who deserves disability benefits would receive them. Unfortunately, however, many people have their disability claims denied initially because of simple typographical errors or misunderstandings. If your claim is denied and you are told that you do not qualify to receive disability, litigation may be the only way to ensure that you receive your benefits. In long-term disability litigation, your case will be brought before a judge who will then decide whether you are legally entitled to benefits or not. It is crucial to have all of the necessary evidence and documents to show the judge so that he or she can make an informed decision regarding your disability. We can help you gather all of the necessary documents to support your claim so that the judge is presented with the strongest case possible. If you are struggling to receive your Social Security benefits or have been denied long-term disability payments, litigation may be the most direct way of recovering the compensation that you deserve. To learn more about your legal options, contact the Indianapolis long-term disability lawyers of the Hankey Law Office today at (800) 520-3633.